In 2012 the skeleton of Richard III King of England 1483-1485 was recovered from beneath a car park in Leicester. 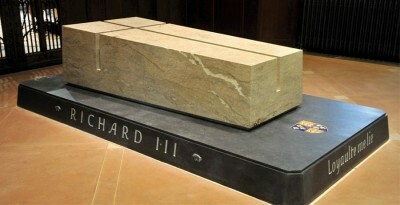 Two years later it was buried in Leicester Cathedral. The discovery attracted a great deal of public interest and also debate about the fate of the former king’s remains. Because of the particular interest in Richard in the north of England, where he had exercised great power during his life, the Institute for the Public Understanding of the Past ran a series of public lectures on his life and the history of his time in 2013-14, collaborated with other heritage partners remembering his links to the region and created some webpages of resources: Richard III: Rumour and Reality. In this section of the website we are now bringing that story up to date by bringing together a set of links to resources relating to the public interest in Richard in the two years between his rediscovery and reburial. In doing so we are most grateful to Marilyn Kilroy for providing us with an initial compilation of press cuttings and related resources and to Luke Giraudet who has composed the following information packs and lists of sources and further information (available to download as PDF files, below).